I've been heading to Maki ever since I was a little kid. I have very fond memories of the incredibly nom-nom Japanese food and the attentive service my family received there. This summer I had a chance to be in the Bay Area again and was so excited to hit up one of my family's old haunts. However, I am almost 100% certain that the ownership changed and the chef and waitresses that I was familiar with are now gone. In this most recent California trip, I've visited Maki upwards of five times...you can say that I'm obsessed. It also helps that my boyfriend lives quite close by to Japantown. You could say that he aids my addiction to Maki and he's probably the worst enabler I've ever met. =P Each time I've dined there, I have had an incredibly varied experience, both in terms of the service and the food. To start things off, Maki is a very, very small hole in the wall restaurant with very, very limited seating space. 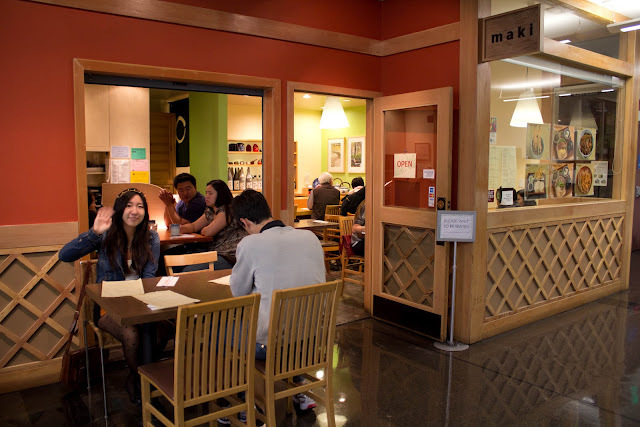 The interior of Maki has both bar and indoor seating that can probably seat about 18 patrons at once. While "outside" the restaurant in the main mall, they have "extra" table seating that can seat an additional 12. In the past, I always remembered that there was always a line out the door. Now, more often than not, my sister and I have been able to walk in without any reservations and get seated immediately. 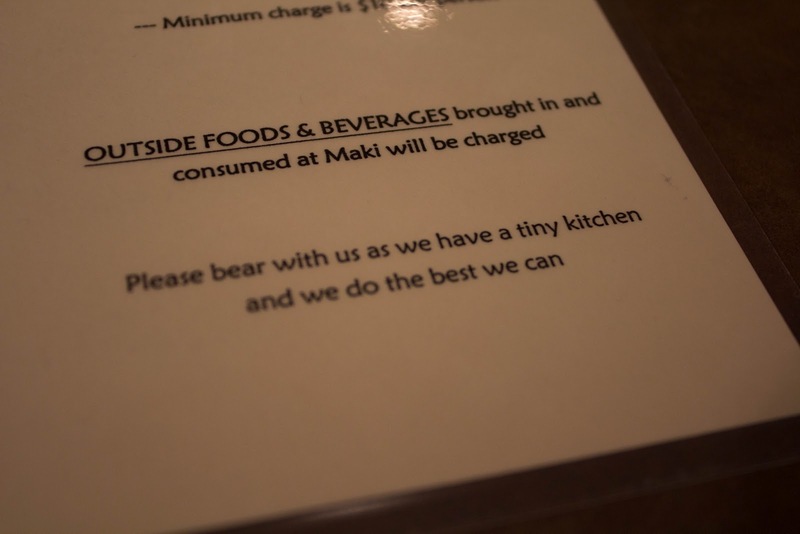 It's a well known fact that at Maki, the food often takes a long time to get to your table because of the small kitchen. However, the "hangry" vibes were always alleviated by the attentiveness of the waiters and waitresses. Unfortunately, more often than not I've had lackluster service. One of the more negative experiences that I've had there was when I asked for my water to be refilled. Even though the restaurant wasn't busy or full to capacity the waitresses seemingly ignored my requests and were quite rude. Even though I had asked for water, multiple times, in the middle of our meal, by the time we had finished we still hadn't gotten our refills. I believe the third of fourth time I had asked the response I got from the waitress was "We're really busy here." There were a total of two women "waitressing" and they really didn't divide the tables very well at all. Maki is probably most well known for its dinner and lunch "sets", which are beautifully assembled and provide a lovely variety of Japanese treats to entice the eyes and galvanize the appetite. The Unagi Wappa Meshi is what my sister ordered and has been her dinner/lunch staple for a long time. The rice is fluffy and a perfect compliment to the egg, peas, and eel. The concept of the set is simple, but executed very well. The eel was tender and moist, while the peas were firm and sweet, and the egg provided that moist egg-y goodness that bound together the viands, vegetables and carbohydrates. Simple in idea, but very well done in execution. This is the Gyu Wappa Meshi, which is composed of thinly sliced meat, peas, caramelized onions, and diced bits of yam noodles. 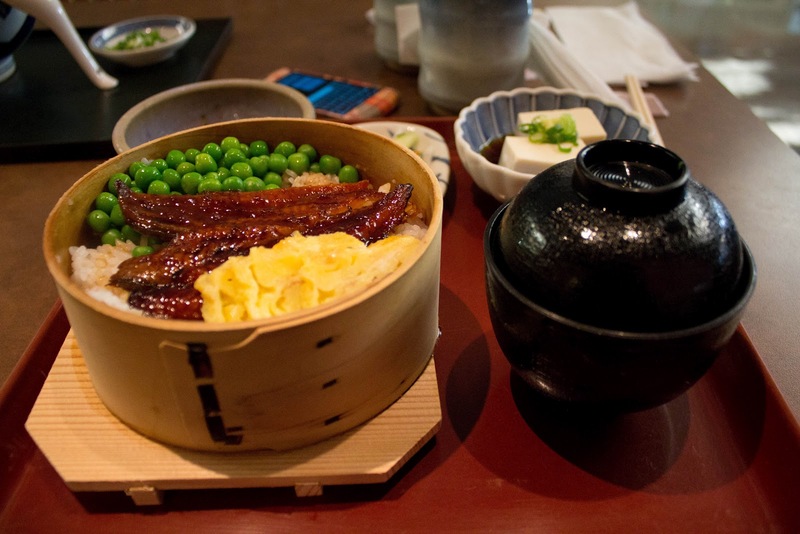 Although both the Unagi Wappa Meshi and the Gyu Wappa Meshi are leaning to the sweet side of things, the Gyu Wappa Meshi is a bit more savory and reminiscent of sukiyaki. 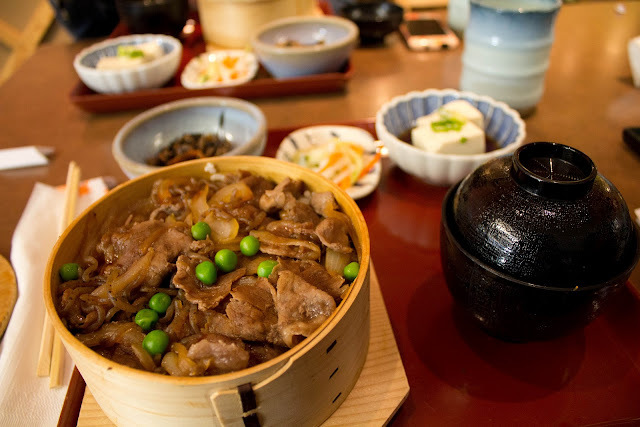 Actually, I would almost have to say that the Gyu Wappa Meshi is really sukiyaki without the portable stove, egg sauce, and accessory vegetables. Well, a much drier sukiyaki, but I think you all get what I mean. Again very simple in idea, but cooked and presented well. These three dishes are the lovely little accents provided when the "meat" runs out and you have excess rice left over. Hijiki is a traditional Japanese seaweed dish, usually consumed in East Asia, and made from shredded carrots, bits of tofu skin, and hijiki! =P Usually a hijiki dish isn't usually eaten alone, but paired with rice or viands. The pickled vegetables are a combination of daikon, cucumber, and carrot...I'm not usually a conoisseur of pickled things (I honestly don't really like anything soaked in brine), but I never found the vinegar and salt taste overpowering or offensive. 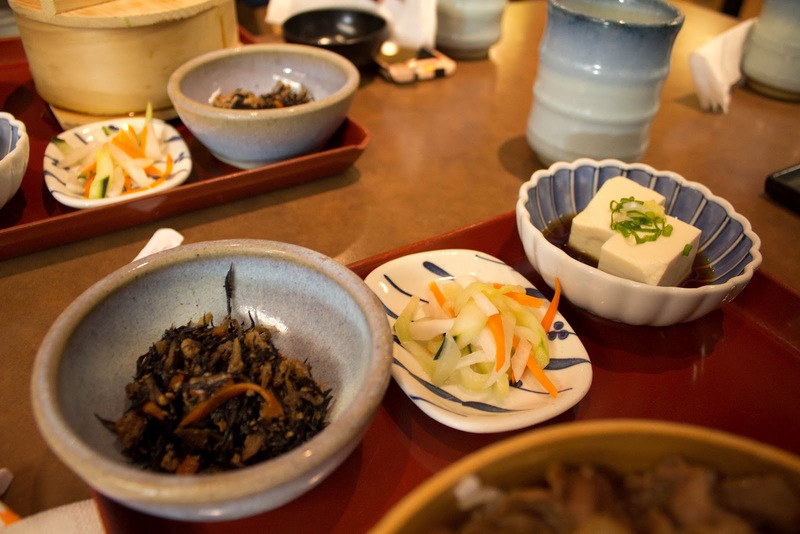 I honestly can't say whether they pickle the vegetables or make the hijiki in house, but they're pretty yum (any my parents have always enjoyed the pickled dishes). As for the Hiyayakko, or the cold tofu, it wasn't anything mind blowingly different..it was a simple, cold refreshing summer dish. The tofu wasn't powdery and the soy sauce wasn't too salty. 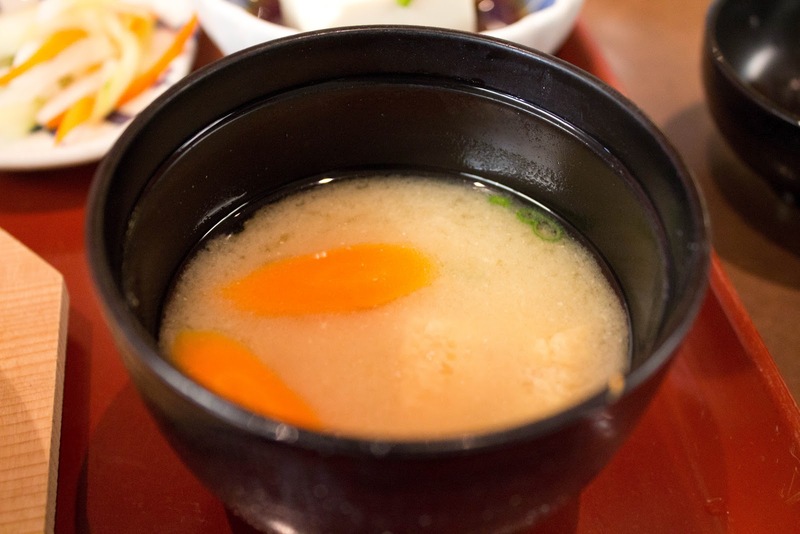 However the highlight of all the little side dishes, for me at least, is the miso soup. It's not one of those cookie cutter miso soups, with tofu, seaweed, and green onions floating on top, but instead it's made with a sweeter, less salty white miso. Included are potatoes, carrots, and daikon. Very, very sweet and delicious and strangely savory. I feel like I can always drink bowls and bowls of this soup. It's very addictive! The unfortunate part is that it only comes with the rice based set meals and if you want to order one on the side it's $3.00. This is what boyfriend chose to order Niku Udon. A very manly, noodly dish. For all of the Maki noodle dishes, as the patron, you're given a choice of noodles: soba, udon, or the imported inaniwa udon. 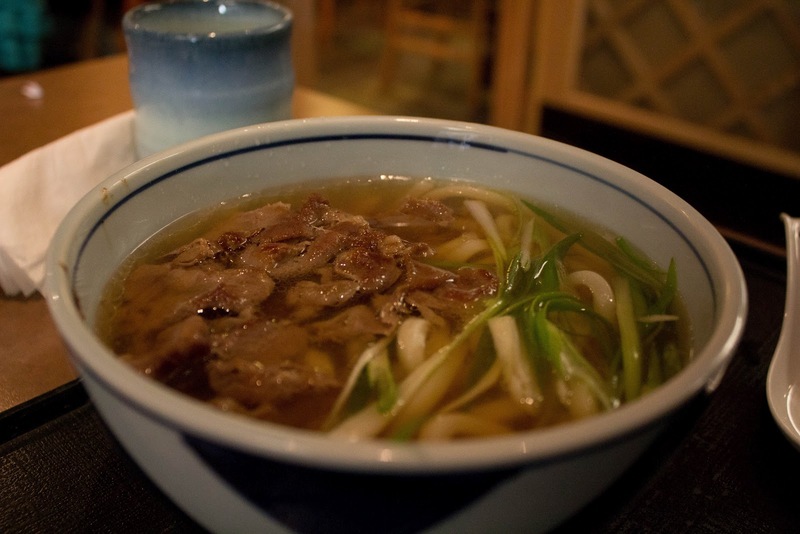 I've eaten many noodle dishes at Maki, both cold and hot, and they always boil their noodles to the perfect chewiness. The are never powdery or dry, but always a delicious stachy indulgence. The soups the noodles are in tend to be clear, I'm guessing a light hondashi broth, with the predominant flavor being the marinated beef slices floating around inside. 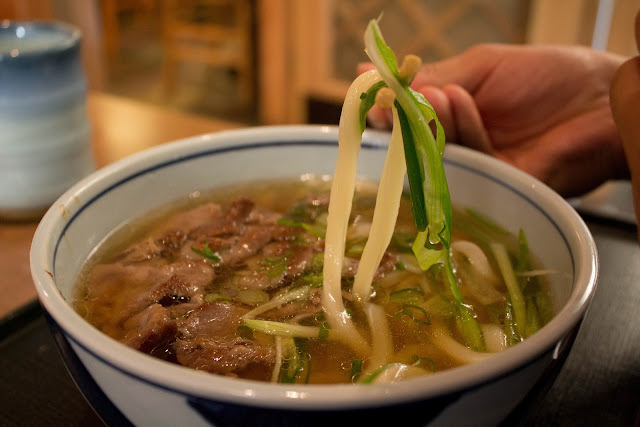 The flavor of the beef is actually the same as the beef slices in the Gyu Wappa Meshi, toned down with the hondashi broth. The green onions, always a favourite of mine, add little bursts of freshness to a rather simplistic, one dimensional broth. Even though the noodle dish tends to be one of those "one note" entrees, I always finish the bowl and if not that the noodles...they're really delicious, not powdery and have the perfect resistance. 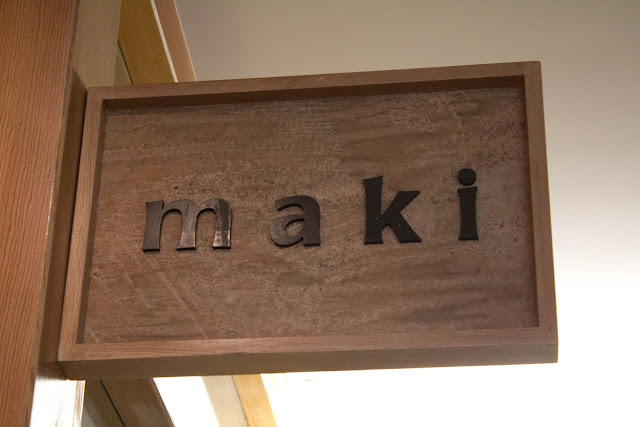 Overall, I would have to say that there are many things that deter me from Maki, but there are an equal number of things that make me want to come back. The service, the price, the slowness of the kitchen are rather significant cons, but the food and location are definitely large pros for me. Aggregating other reviews I know that the price and the flavor, the sweet lean of all the dishes, deter people from returning. I know the predominant flavor in all the dishes is sweet, but I don't find it too obtuse or cloyingly sweet. I find that I enjoy the savory sweetness each dish offers. The menu is only the length of a printer page (double sided), so I feel like if you go as many times as I have, a lot of dishes have overlap or use the same ingredients. I would return, but since I went so often this summer, I would probably go after a lengthy break. Kid Friendly: Yes! It's cramped though, so I'm not sure if there would be room for high chairs or anything.